OK, so let’s start at the beginning. In order to ride a moped or motorcycle up to 125cc on the UK public roads, you need to have completed a Compulsory Basic Training (CBT) course run by a Driver & Vehicle Standards Agency (DVSA), formerly the DSA, approved training body (ATB). Click here to search for your nearest ATB. For an overview of the CBT or to see if you are exempt from needing to do this, click here. The CBT validates your provisional driving license so that you are legal to ride a motorbike up to 125cc on ‘L’ Plates. However, 16 year olds can only do their training and ride a 50cc moped, whilst 17 years old and above can ride on a moped or motorbike up to 125cc. The CBT certificate is valid for two years in which time you should have either passed your full motorcycle test or need to do another CBT to keep your license valid. So you now want to take the full motorcycle test so you can throw away the ‘L’ Plates and ride a larger motorbike. Well these days it is not as easy as that, depending upon your age and the motorbike you take the test on, will determine which motorbikes you can ride on your driving license. For further information on this, click here. Before booking your motorcycle practical test, you need to have passed the driving theory test, click here for further information on the theory test. You can practise your driving theory test here. However, the Motorcycle Theory Test is slightly different to the normal Driving Theory Test in that it has some questions that are directly related to motorcycles. 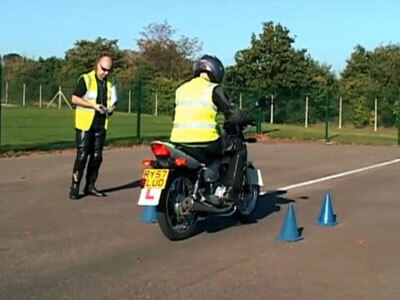 Once you have successfully completed the theory test and your DVSA approved motorcycle instructor has said you are up to the required standard, you can book your motorcycle practical test. This is in two separate modules. 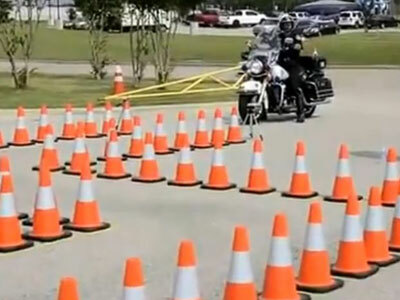 Module 1 is an off-road module, where you ride around cones in a secure test area. Module 2 is an on-road module, where you will be followed by an examiner on a motorcycle or in a car, in both methods the examiner will communicate through two-way radio. After the motorcycle test, you need to get your own motorbike and gain some experience. The best way of doing this is riding as often as you can, even if it is just down to the shops and back, every little bit helps and the sooner you become familiar with your bike the better you will feel about your riding. But it doesn’t stop there. There are many forms of extra motorcycle training you can do with many different companies. Even for previously experienced riders who come back to biking after a long rest period, or as we often say, ‘born again bikers’ can be at danger of an accident. This is normally because of combined circumstances of their riding skills being very rusty and the fact that many of today’s motorcycles are often much more powerful than what they used to ride, so additional training is highly recommended. There is an informative website about back to riding here. I reckon the best place to start, whether you are a new rider or an experienced rider, is the UK Police run Bike Safe scheme. Bike Safe is exceptional value for money and gives you a taster as to what advanced riding is all about. If you enjoy it, then you can go on to enrolling on an IAM or RoSPA motorcycle advanced training course where you will receive a nationally recognised certificate upon successfully completing the advanced test. The Institute of Advanced Motorists (IAM) has a section just for motorcyclists. You can buy the ‘Skill for Life’ package which provides you with all you need to pass the advanced motorcycle test. To find out more click here. Once you have passed the IAM advanced test you have the qualification for life and currently no need for re-tests, but they have introduced an even higher level with the ‘IAM masters’ programme, details of this can be found here. Likewise, the Royal Society for the Prevention of Accidents (RoSPA) also has a section just for motorcyclists and you can learn about that here. Upon successful completion of the RoSPA advanced motorcycle test, you will be graded to either Bronze, Silver or Gold status. However, with RoSPA, in order to keep your advanced qualification you need to have a re-test every three years. Due to the increased interest in adventure bikes and adventure riding, off-road training is seeing a boom and there is no shortage of companies to choose from. One of the longest and most popular companies offering courses for beginners to accomplished riders is the Off Road Skills training school based in Wales. They are affilated with BMW and the training centre is run by the famous Dakar rider Simon Pavey. Another excellent place that was recently setup in Norfolk, is Adventure Bike Training, run by ex Off Road Skills instructor, Kevin Hammond. Here Kevin will teach from beginners to accomplished riders in small groups or one to one training if you prefer. 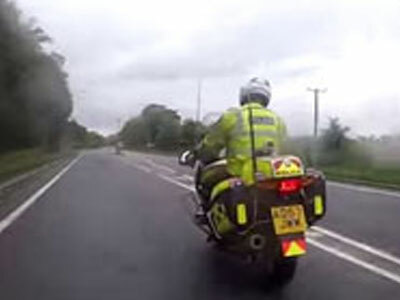 How to ride like a Police biker!